This greatest hits compilation was released in November 1979, about five months after their biggest sales success with the release of Discovery in June 1979. 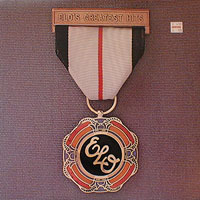 In addition to taking advantage of the big sales and their popularity in 1979, ELO had never really had a greatest hits collection that included nothing but material that made it into Billboard's Top 40. So they released this. This album eventually was certified as multi-platinum and made the top 10 on charts throughout the world (only #30 in the U.S.). However, even with such credentials, it's not really that enjoyable of a listen to me. I have often found that their pop hits were more enjoyable when they were interspersed with songs that were never intended to be singles, such as on their studio albums. A strange thought I guess, but by themselves their pop hits leave me with a cheesy aftertaste. If that doesn't make a whole lot of sense, then I guess I can't quite put it into words. One thing's for certain, these are just pop hits and lack the "progressiveness" needed to go beyond two stars. For collectors and completionists only. Pop rock fans might enjoy this, maybe.